«Our God, help us,» 22-year-old Muhammed mumbled when he saw the sea. He was on the shores of Libya. On the other side was Europe. But he had to get on that boat. The young Moslem had a dream, you see – to become a big businessman. And where else could he do it if not in Europe, right? Young Somalis surveying the map of Europe, as if it was their first close glance. They want to go to Germany and Belgium. Ahmed (19) plans to become a doctor, Muhammed (22) a businessman. On the North-African coast, Libya is the weakest link. Instead of a government the country is ruled by chaos. Many migrants start their journey to Europe here. In the initial three months of this year alone, 10,237 people crossed the Mediterranean to Sicily, Italy. In Estonian terms, like the entire town of Haapsalu. Most hail from Gambia, Senegal and Somalia. Of these, only the Somalis have the right to ask for asylum due to the war raging in their homeland. The rubber boat that took Muhammed towards Sicily was packed with 120 people. A bus full of people, more or less. But the passengers on the boat did not sit on benches, but on top of one another. One squats down, another sits on his knees, and a third perches on his back. They spent two days squatting on the sea. «Did you sleep on the boat?» I ask. Muhammed raises eyebrows. He has long eyelashes and a smile hard to hold back. This is his fourth day in Europe. «We couldn’t even move,» he replies. Muhammed says he knows nothing about Estonia but would like to go to Germany. «Do you have any advice for us?» he asks with Ahmed, whom he befriended on the boat, right after the camera shuts. So I ask if they know about racism. They don’t understand what I’m talking about. Other Somalis call Muhammed to lunch. Down the dusty road, he runs to the centre. Paid by the Italian government, they get food, water and an accommodation till they move on. And most do. But Angelo, Giuseppe and Enzo, elderly gentlemen in Sicily, think that even this is too much. Torn by economic crisis, Italy ought to take care of its own first, they say. «We are all hungry here!» blurts Giuseppe. Like three cats, they bathe in the sun in the tourism town Syracuse. 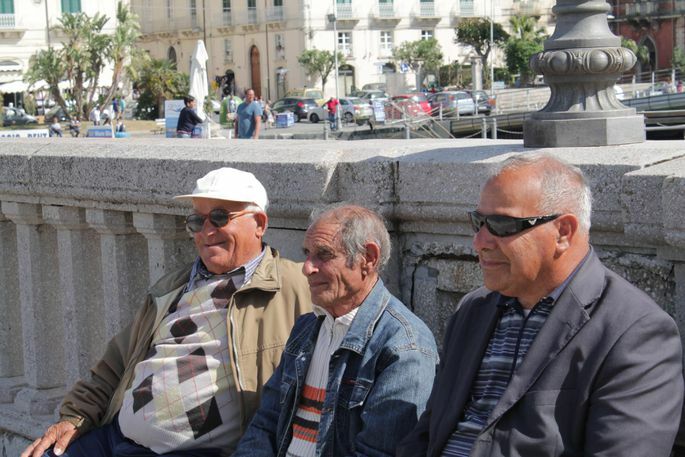 Angelo, Giuseppe and Enzo, natives of Sicily, want nothing to do with the migrants. 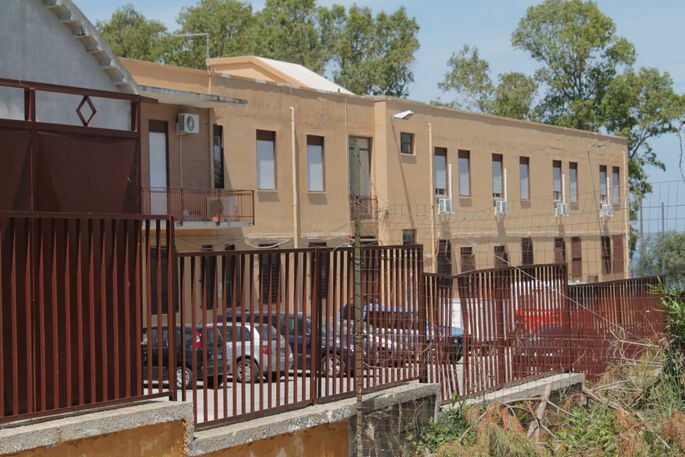 Sicily is full of migrant centres. Ahmed and Muhammed are also staying in Syracue, just in a suburb down at the sea. Over there, we find Anastassia Voronaja, from Estonia. Her job is to listen to the arriving migrants. A police and migration officer, she is in Sicily as part of external borders agency Frontex operation. Some talk for hours, says Ms Voronaja. They need to get the gruesome memories out of their system. Some say nothing at all. She is tired. During her month in Sicily, she has hardly had any time for herself. The yellow centre where Anastassia works looks like one of the schools built during the Soviet Union. But the young lads here are all wearing dark sports suits and white Crocs slippers. Just like Ahmed and Muhammed. You can see that they know what hunger means. And unbrushed teeth for months. A man splashes water unto his armpits. Four are plastering the stone floor. You can hear laughter and a joyful babble. As if they had all just won a million with a lottery. For many migrants, the refugee centre in a Syracuse suburb is their first shelter in Europe. 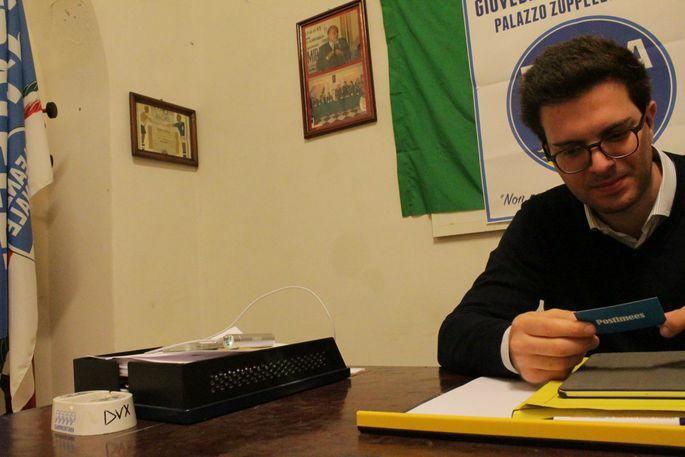 «We should already separate the asylum seekers from the economic migrants on the North-African coast,» says Pietro Forestriere, head of a local rightwing party Fratelli d’Italia. And other European nations should give more help. For instance, the refugees could be divided between European states, according to population and percentage of the unemployed. Pietro Forestriere, head of a Sicily rightwing party in his office. As Italians go, Mr Forestriere is half an hour late for the interview. A serious and tall man, he does stand out among the locals by the lofty strides that take him onwards. The party office is smaller than a rich man’s bathroom. The ashtray on his desk features «DVX» (pronounced «dux»). This is how they greeted Mussolini. A local interpreter says this would surely have been hidden, had an Italian TV channel been there and not Postimees. Mr Forestiere’s office is in Augusta, an hour’s drive from Syracuse. Here, they have a navy base; a large part of rescue-the-migrants operations are launched from right here. The people of Augusta are used to the migrants. In the town of 30,000, the market place is tiny. Just two rows – on the one hand, strawberries the size of a child’s fist, on the other clothes heaped on tables. A fishmonger says don’t you listen to them old Sicilians. «They have lived their lives, already. What matters is what the young people think.» He personally thinks that migrants are people of flesh and bone, like we all. We definitely ought to save them. Even so, he asks to remain anonymous. Rosaria Consoli, a seller of strawberries, agrees that European authorities should tackle the migrant problem before they ever undertake to brave the waves – on North-African soil. As it stands, smugglers make millions on the migrants. 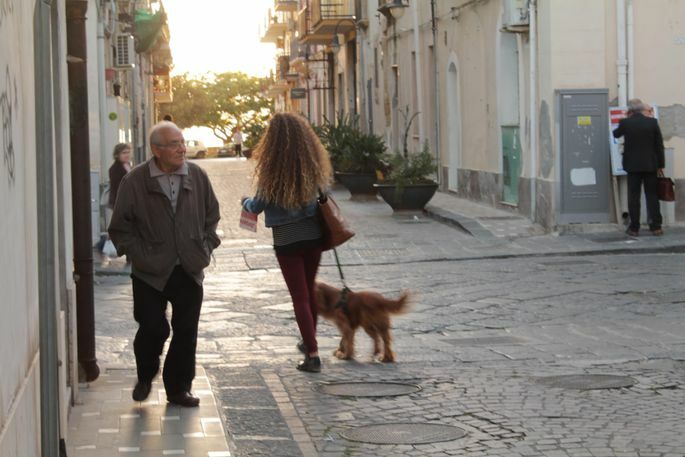 During these two past years, Sicily has become a gateway to Europe. As confirmed to all who spoke to Postimees, this is felt. Mr Forestriere says what the migrants mostly do is lower the working standards. They agree to work for less pay and under worse conditions. The port of Augusta looks deserted. This is the place that, just some few weeks ago – after over 700 people perished during a week – the media directed its piercing gaze. There’s just these three migrants on the berth, staring in the distance as if wondering where to go now. Bottles and cigarette packages are scattered all around, as well as wooden pallets and ropes tied to the ground. It’s quiet and desolate – not like we imagine Sicily. On my way to Augusta, a local lady told me this is a town of the so-called death triangle. Formerly, this was a farmers’ paradise. He very own grandparents used to till the ground there, the yard filled with animals. Then, they struck oil in the sea near Augusta – from then on, lion’s share of locals toil for the international oil company. Despite the fact, gasoline costs the same as all over Italy. In two days, Muhammed made it across the Mediterranean and into Europe. That was luck. According to Frontex press rep Ewa Moncure, refugees may spend up to four days at sea. The other thing Muhammed was lucky about was staying alive. Allegedly, every tenth dies on their way from Libya to Italy. Muhammed and Ahmed are demonstrating their emotions as Europe emerged on horizon, its housetops and ships.